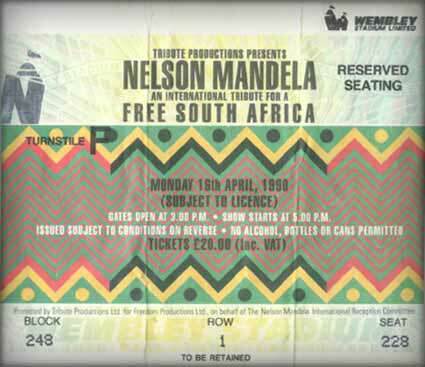 This is a hand held recording I made at Nelson Mandela's Wembley Stadium appearance, London 1990, just after he was released from 27 years in jail. The transcript of the recording is below - the wild thing is it takes over 6 minutes to get through it. Nelson Mandela was on stage for all of the applause. He stood and smiled as 170,000 people in 'Special AKA' t'shirts screamed at him. Most people I know can't take a compliment let alone adulation. Nelson took it like autumn sun shine. The guy who introduces him is a little old anglican priest, Trevor Huddleston, who I imagine was also foreign to stadium rock environments.